If you love blue flowers and butterflies, this easy-to-care Blue Plumbago plant is then a must in your garden. It is a vigorous grower and a non-stop bloomer, profusely flowering spectacularly all year round especially in the tropics. 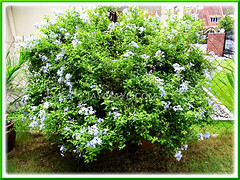 Early February this year, we came across a huge scrambling Plumbago cascading beautifully over a 10 feet retaining wall of a bungalow. It looked so strikingly stunning in that sea of sky-blue flowers! Simply splendiferous! A pity I was without a camera then! Plant type: Ornamental shrub, native to Tropical Africa. Light: Full sun to semi-shade, though flowers best in full sun. Moisture: Average water needs. Water regularly, but less once established. It is reasonably drought tolerant. It does not like wet feet, so do not overwater which may lead to root rot. Too much rain on its delicate flowers or leaves may quicken its death. Soil: Though adaptable to any kind of soil, it prefers a mixture of loamy and light sandy soil, slightly acidic pH, and with good drainage. Propagation: Easily propagated from seeds, semi-hardwood cuttings or division. The easiest method of propagation is by separating its root ball or remove rooted suckers from the mother plant. Features: Plumbago auriculata is an evergreen perennial shrub with vine-like habit. If unchecked, this fast-grower can reach 3-10 ft (0.9-3 m) high with a similar spread. It can be trained to grow like a scrambling vine on supports or allowed to sprawl on the ground with its long arching branches, or even pruned into a compact mounded shrub. Plumbago has slender semi-woody stems that are typically multi-branched or clumping and covered with alternate 1.5 to 2-inch oblong leaves that are yellowish-green in color when young and darken to medium green when mature. Its undulate leaves are thinly textured and at each leaf’s base clasping the stem are little ears (winged-like leaflets), hence the name ‘auriculata’. 5-petaled tubular flowers are borne in rounded 4-6 inches wide showy clusters at terminal stems. There are sticky, gland tipped hairs on the flower calyx and stickiness on its seed capsule too. Flower colors vary, ranging from pale blue to white or darker blue. The variety ‘Alba’ has pure white flowers, ‘Imperial Blue’ has royal blue or baby-blue flowers whilst ‘Royal Cape’ has intense cobalt blue flowers. The white variety is less prolific than the blue ones. Plumbago blooms profusely throughout the year in the tropics, as well as in all temperate seasons except for the coldest winter months. Usage: Plumbago is popularly grown in garden borders and beds, in parks, or raised planters along sidewalks and road dividers. Its sprawling habit and vigorous growth makes Plumbago very popular in large gardens, slopes and landscapes, as it quickly covers large areas. Plumbago will be great for window boxes, and make wonderful porch or patio container plant as its arching branches of attractive blue flowers cascade over the sides. Being hardy and resilient, Plumbago will be excellent as a formal or informal hedge as it responds well to pruning. Being vine-like, it is most suited to train on a chain link fence, trellises or espaliered against a garden wall for a dramatic blue effect. 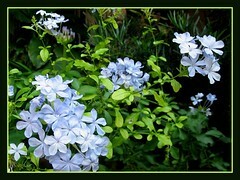 If you’re a nature lover, try mass planting Plumbago in your garden to attract birds and butterflies. It is the larval host plant and nectar source for several kinds of butterflies. In some regions, Blue Plumbago is traditionally used to treat warts, broken bones and wounds, including a snuff for headaches and as an emetic to dispel bad dreams. As a fun object, its sticky flowers are often stuck to earlobes as earrings by children. 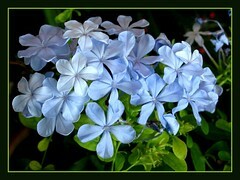 Care: Blue Plumbago is a low maintenance plant that practically thrives on neglect. Locate it at sunny and warm sites for best growth and flowering. During watering, try not to wet its delicate flowers. Feed it every 3 weeks or so with a balanced fertilizer during the growing season. You may want to prune it after flowering to remove old stems, or at any time of the year to remove excessive growth and keep tidy. It is extremely resilient and will flower profusely after being cut back or after a growth flush, as it bears flowers on new growth. It is least bothered by pests and diseases. For temperate zones: Hardiness – USDA Zone 8b to 11. Plumbago is frost sensitive, though will quickly recover when killed to the ground. Best to protect the plant when frost occurs. More information at PlantzAfrica.com. 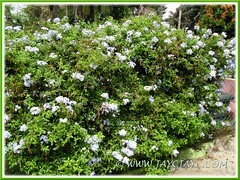 This luxuriant and amazingly large Blue Plumbago bush was seen growing at one of our relatives garden. Simply gorgeous! Think it’s about 1.5 meters tall and as wide. The bush is planted in a large pot with its base removed and half-embedded into the ground. Looks happy and most contented growing this way and basked by the morning to early afternoon sun! Hmm…I am as curious about Blue Plumbago’s seeds too, have not seen any on our plants so far? Help!!!!! My plumbago is suddenly looking horrible. They leaves are turning yellow. What can I do???? I have a plumbago and live in a suburb of Chicago. What should I do for my plant for the winter months. Can I keep it in the ground? i live on Long Island, New York – last winter i brought my plant indoors (didn’t know what it was called) and it bloomed on my kitchen window sill – do i understand that it can be planted in the ground and survive the winters? My plumbago has very few flowers. What do I need to do. my plants are dying. They are turning brown and look diseased. It has gone from one plant at a time to another. It is a systemic problem? Could they be getting too much water from the sprinkler system. We live in St. Augustine, 32092..
I’m not sure what’s the matter with your plants but past experiences of growing blue plumbago had proven time and again that their delicate blooms and leaves are very sensitive to too much rain, and coupled with ‘wet feet’ which it does not like, will bring about its demise sooner than expected. Thanks for sharing your gardening experiences and providing new insights, Heather! My bright blue plumbago was a gorgeous addition to my garden until brush-tailed possums decided to massacre it. (This is in Melbourne, Australia.) Since being decimated by the possums, the plant has developed a horrible sticky whitish dust all over it. I’ve just cut it right back to try to improve its health, but can anyone suggest what this dust might be and how to treat it?? Just found my answer! It is a naturally occurring chalky residue. So now my problem is just the naughty possums..
Just planted some Cape Plumbago:) I have heard that overtime that the flowers fade on this variety? I had the most beautiful plumbago and when I began to lose my sight this was my absolute joy sadly I asked someone supposed to be a gardener to help me trim shrubs back the plumbago dies a beautiful rose has never recovere and now grows at completely the wrong angle and my beautiful philadelphus didnt bloom for 2 years. We’re delighted to read that you’ve regained your sight and is looking forward to grow plumbago again. May it grow to be more beautiful than your previous and bless you with abundant blooms for many years ahead. just found my answer ! my plumbago is suddenly looking dry, like yellow how ? please tel me about that. Thank you! Thank you! Thank you! 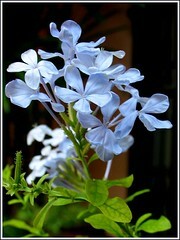 I just found out that the beautiful plant I was given as a gift is the Plumbago. It loves the water, and the sun. By the way…the Hummingbirds LOVE it also. Thank God for this web-site. You’re most welcome, Amy! We’re delighted for you. Thanks for brightening our day with your sweet words. Thank you for this site, I have found great information about my Plumbago Auriculata, but I have one question please: I have two plants since this summer (2011) and I live in Ireland in the Midlands. There are some blooms appearing now on one plant, but I have read they are frost sensitive. Do I need to dig up the plants and place them in the shed or greenhouse, as we may have a very hard winter this year again down to minus 5 or 6 perhaps. What shall I do? Thank you for any advice. I have a Royal Cape which has been beautiful for around 9 years. I trim after flowering each year and always get a beautiful show. However this last week I have noticed one half of the shrub is dying the leaves droop and then go brown. What can I do to save this gorgeous plant. We’re in tropical Malaysia without the 4 seasons, so unable to provide the right answers. Sorry! However, I’ve just googled about overwintering Plumbago and think the article by Missouri Botanical Garden may be helpful for you. Take a look. Thank you for the referral, I’ll try their suggestions. Looking forward to seeing the plants next spring. Thanks again. Best of luck and happy gardening. Plumago responds very well to hard pruning so yours should grow back very soon, make sure you fertilise (Seasol) and water every day given you are in Perth. I am in Tasmania and we get enough rain to keep them watered. I’ve had my plumbago for over a year and it’s only partially bloomed once. I live on the coast in San Francisco, lots of fog. Would that be the problem? or is there something I could do? I love the plumbago , but i noticed that after a flowering spell, the plant tend to get dried up and rot away at the bottom and the plant looks awful. Only the top of the plant looks green, and it appears as if it is dying, but it still sends out new leaves. I live in Trinidad in the Caribbean, and I’m concerned that since we have only two seasons, (wet, and dry) if this could be the reason. I need an answer to this seeming dilema. I took two (2) slips from my Plumbago in the late fall. Planted each of them in a separate pot and kept them under grow lites in my basement. Both plants have rooted and growing. should I cut each one back or what. @ Marilyn, I think you need to give your plant a full pruning to get rid of the dead branches and dried up flower shoots. This should give your plant a new lease for growth and flowers. I love my newly acquired Plumbago, I live in EasternOntario with relatively harsh winters, do You think if I cover it, it will survive or should I bring it inside. thank you so much also I was told that the deer do not like it, yippee, they have completely devoured my hostas. I used to get from the USA Liquid Fence rabbit and deer repellant, but cannot find it is Canada, and it really really worked. Hi Patricia! Googling results show that these plants are frost-sensitive and hardy only to USDA Zones 8b-11. Hopefully other visitors from Ontario to this site will be able to assist you as we’re unable to help you further, being in Malaysia without the 4 seasons. Hi, just wondering how far apart I should have the plumbago plants in order to form a hedge? Hi Teresa. My 2-cents worth is plant them about 2-3 ft (60-90cm) apart. I marvel as I read the postings here as there is information giving and seeking taking place from all continents and the common thread is plumbago today. Just incredible that we share such promising information yet the heads of state will wage war in a millisecond. Shame shame. Thank you for your diversity and your referrals. I need not post yet but I suppose that is about to change as my 6 plum’s are coming and going IN in about 5 days. Keep you posted and PEACE to all who enter here; and thensome. It’s truly wonderful to have visitors from around the world and interacting with one another. Yes, do keep us posted about the outcome of your plumbago… we love to hear from you! So glad I found this site. Iam finding out alot about my Plumbagos. They are such a beautiful plant. I live in South Florida and they grow her so beautifully! Help! We had 8 blue plumbagos put in our new landscape last spring here in central Texas. But now, one by one, they are dying back since the Fall. I see these plants all around our area and no others look like mine. We have been very dry, but run the sprinkled once a week. Ive check the moisture and its normal. Only thing I am wondering about is that we have large river rock for mulching. No idea what might be causing it. Could grubs be attacking the roots? My plumbagos have webs on the flowers and what I think is mites. What can I use to rid my plants of these pests. Hi Michael! We don’t use pesticide as I’m allergic to them. Heather in her comment dated Sept 18 2010 mentioned that she uses Bayer spray for insect, disease, and mite control on the plumbago… you may want to try that. Googling for Bayer spray for plants landed me on this site for 3-in-1 insect, disease & mite control …just sharing in case you’re interested. Jacqueline….thanks for your information. I’m always looking for non chemical pesticides. I will check into your advice. Glad I found this site. You’re most welcome, Michael. 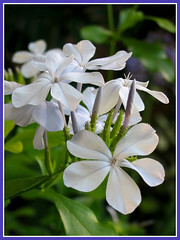 Hope you have success in ridding your plumbago of pests. My plumbago just won’t seem to flower. The plant itself is beautiful and has occasional flowers on the ends of the plant. I’m guessing you will tell me to cut it back. I live in South Georgia and the plant wintered real well. Sun though, is absolutely required. Also, good drainage and ample moisture really help. I just love the way the blooms reach out to show off and make the dome shaped clusters. They’re so fine and dainty. It is a joy to observe it closely and frequently. Carl… we’re so happy for you. 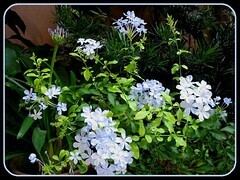 May your plumbago bush continue to cheer you endlessly to make good for lost time. So beautiful and so delicate too. Indeed, Sea Glass Jewelry! Thanks for dropping by. Have a great weekend! A lovely shade of blue. I don’t think they are hardy enough for the UK though. Indeed they’re beautiful, Sea Glass Jewelry. Give it a try and hope it surprises you. Happy gardening.